At Umbrella Consultants we can help with all phases of your new website - from concept and graphic design to development and hosting. With Umbrella's CMS your business is ensured of an easy and scalable solution that grows with your needs. 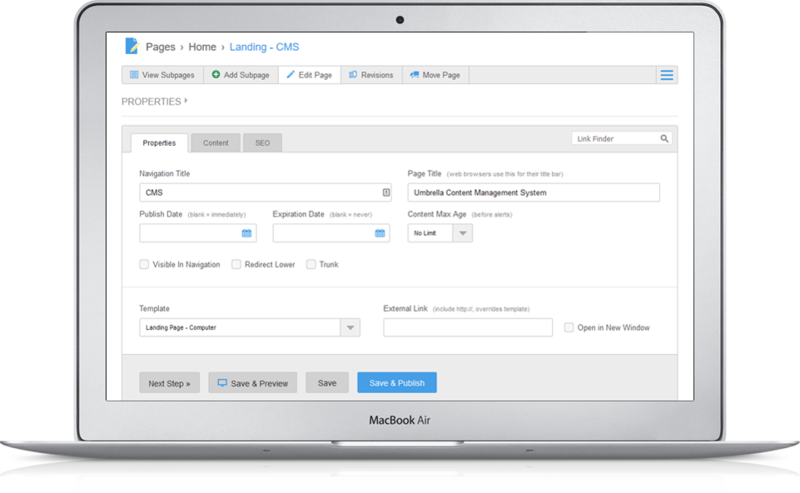 Umbrella CMS is designed with an eye for ease of use and intuitive interfaces, ensuring Umbrella CMS can quickly perform complex tasks - with little training. Whatever design you have in mind, it can be made in Umbrella CMS. Our flexible template system provides the freedom to think big and we make sure that the internal design guidelines are followed to the letter. With Umbrella CMS you can express yourself as you want, whether you want to add a blog, photo gallery or need us to develop your own module/extension. Umbrella CMS is developed with an eye for security, so you can concentrate on developing the content. We quality assure all products before they are sent out, and in addition we regularly test for security holes and flaws. With Umbrella CMS you have a wealth of options. The list of modules is long and growing month by month. You can customize the design and functionality of standard modules or we can develop your very own modules. Umbrella CMS has a sophisticated core that can read and integrate with data from many different sources. If it has an API we are 99.99% sure that we can get the info you want. Save time and ensure brand consistency and quality with a shared content library. The Content Pool is a source of inspiration for the entire organization. It makes it easy to locate and repurpose top-performing content.